Elf On The Shelf Is Creepy And Prepares Children To Accept A Police State, Some Researchers Believe. So What's The Deal? The first time I saw an Elf on the Shelf doll, I thought the idea was pretty clever, but it seems there's a compelling argument to be made that it's actually pretty creepy. One researcher thinks that Elf on the Shelf actually primes children to accept a police state by normalizing surveillance, and plenty of other professionals have other objections as well. So should we be worried about the dimpled little elf? If you're not familiar with the Elf on the Shelf phenomenon — aka, you haven't been in a house with children under the age of ten during the holidays for the past few years — Elf on the Shelf consists of both a book about one of Santa's elves and an accompanying elf doll. In the lead up to Christmas, parents hide the elf doll around the house in amusing or unexpected ways and the children are encouraged to find him — but not to touch because the elf is there to keep track of them and report back to Santa at night. How else will he make up his "Naughty and Nice" lists, right? But while the concept seems cute and fun, in practice, some people worry that it gets kind of, well, creepy. Elf on the Shelf presents a unique (and prescriptive) form of play that blurs the distinction between play time and real life. Children who participate in play with The Elf on the Shelf doll have to contend with rules at all times during the day. ... This is different from more conventional play with dolls, where children create play-worlds born of their imagination, moving dolls and determining interactions with other people and other dolls. To Pinto, the whole set-up is reminiscent of "The Panopticon," the hypothetical prison designed by Jeremy Bentham in which prisoners never known if they are currently being watched or not, but are constantly aware that they could be. And teaching kids to accept such conditions early in life — teaching in fact that this is a perfectly normal way for the world to operate — maybe isn't quite in line with the values we want to instill in a free society. It's also possibly detrimental not just for kids' worldview, but for their immediate mental well-being, too. Child psychologist Emily Gifford told Live Science, "Think about it. He's a tiny, little elf with wide eyes and bulging, shiny, red cheeks that watches you all day taking notes on your behavior. Once you are asleep, he 'flies off' to the North Pole with one goal in mind: to explicitly tattle on you to Santa Claus." The whole set up, she concluded, is "Totally creepy." Pinto said that she has also received letters from parents whose children were distressed by the elf and the feeling that he was constantly watching. Which makes sense — no matter how old you are, the idea that you're being constantly watched by someone who is taking notes on your behavior so they can report on you is unnerving. 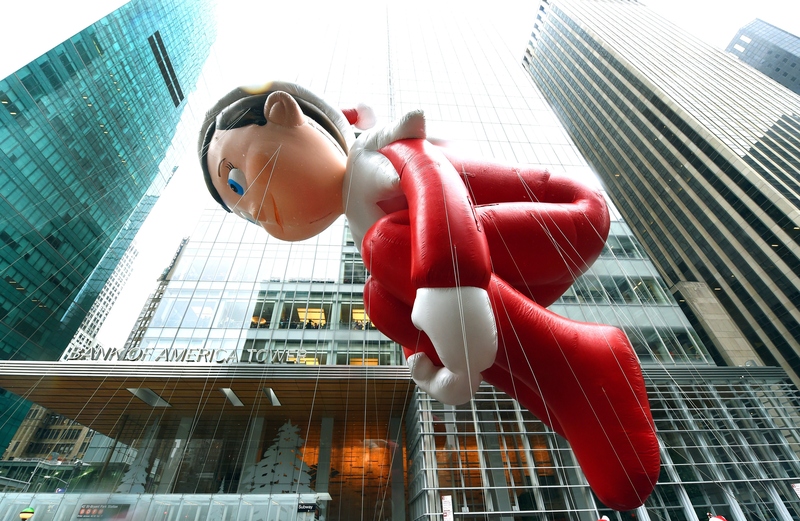 Of course, for many kids, Elf on the Shelf is undoubtedly a fun holiday tradition. Over 6 million have been sold, and parents across the country seem to take great pride in coming up with new and innovative ways to position the doll every day. And Pinto doesn't think parents should stop using the doll altogether. Instead, she says there are ways to make the doll more fun and less stressful for everyone. "Not all parents play by the surveillance rules," Pinto told Live Science. "For some, it's just a toy that does crazy things at night." She also recommends letting children pose the doll some nights to surprise their parents, thereby letting the kids exercise some control over the game. And instead of being characterized as mischievous and all-powerful, the elf could be portrayed by parents as kindly or bumbling.